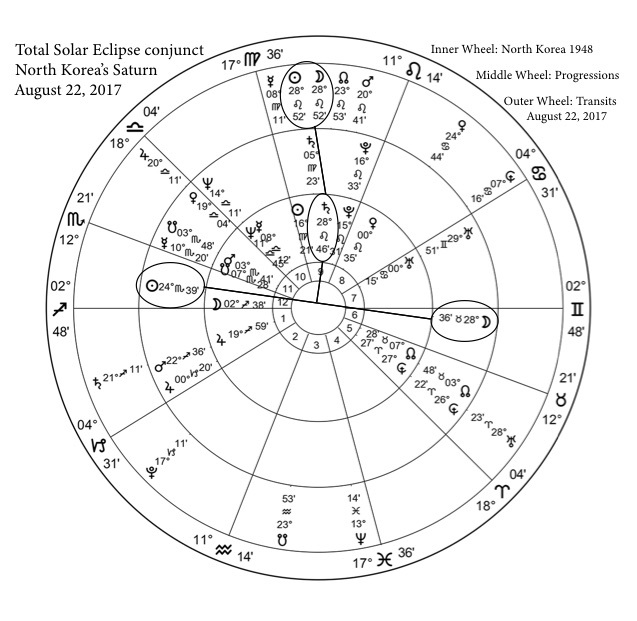 It’s not just Donald Trump who has a major hit to his chart by the total solar eclipse in 2017: in North Korea’s chart*, Saturn at 28*46’ Leo is conjoined by the position of the August 21 eclipse at 28*52’ Leo. North Korea’s Saturn is positioned in the ninth house of foreign commerce, communication, and international law. At the moment of the eclipse, the progressed Moon 28*36’ Taurus squares the eclipse from the sixth house of the military and weapons. North Korea is experiencing a progressed Full Moon, as the progressed Moon opposes the progressed Sun 24*39’ Scorpio. Thus this progressed Full Moon is being activated by this eclipse. With Cancer, the sign ruled by the Moon, ruling North Korea’s eighth house of death and destruction, and the progressed Sun, representing the leader of the country, in Scorpio, the sign that naturally rules the eighth house, this progressed Full Moon explains Kim Jong Un’s obsession with developing nuclear weapons, and the recent bout of missile tests. On the day of the eclipse, Mars 20*41’ Leo trines (120* angle) Saturn, natal Jupiter and progressed Mars in Sagittarius. Aggressive rhetoric from a bellicose foreign leader lights a fire for North Korea. But with the eclipse point conjoining natal Saturn, and making a trine to progressed Jupiter 0*20’ Capricorn, Saturnian restraint keeps things in check for now, as foreign leaders pressure both North Korea and China. The eclipse falls in China’s seventh house of international relations with allies and competitors. Mars in Leo conjoins China’s natal Mars and Pluto, indicating a lot of pressure on China. The progressed Moon 15*21’ Cancer conjoins Ceres 17* Cancer and they oppose Pluto at 17*11’ Capricorn, with Jupiter 20*11’ Libra squaring (90* angle) both of them. It’s a difficult balancing act for China to contain both sides of the conflict, but international opinion considers it to be China’s job to do so. Ceres rules the movement of people, money and trade across borders, so Ceres’s involvement with the progressed Moon indicates that China may be confronted with the threat of trade sanctions if she doesn’t reign in her unruly protégé neighbor (signified by Uranus 28*23’ Aries in the third house of neighboring countries). The USA chart has the eclipse falling in the ninth house, opposing the natal Moon 26*58’ Aquarius in the third, and making a trine (120* angle) to progressed Venus 27*47’ Aries and Uranus 28*23’ Aries in the fifth house. This indicates a sudden, war-like event, but probably more of a war of words at this point. The fifth house rules speculative markets, and with Uranus and progressed Venus making another wide trine to Saturn 21*11’ Sagittarius, with Capricorn (ruled by Saturn) ruling the USA second house of currency, there could be a sudden reversal in the dollar. What’s even more intriguing about this time period for the USA chart is that progressed Saturn 3*3’ Scorpio and progressed Hades 3*25’ Scorpio conjoin North Korea’s natal Mars 3*41’ Scorpio. As Uranus moves through the early degrees of Taurus in 2018 and 2019, and opposes these positions in the USA and North Koreas charts, the USA is now challenged and determined to crush North Korea. May 16, 2019 is especially important, as transiting Venus conjoins transiting Uranus 2*-4* Taurus while opposing the transiting Moon and the USA-North Korea configuration in Scorpio, and transiting Saturn 20*17’ Capricorn exactly conjoins the South Node. With transiting Mars 0*5’ Capricorn conjoining North Korea’s natal Uranus, and transiting Neptune opposing North Korea’s natal Sun (the leader of the country, Kim Jong Un), Kim’s delusions of power could make him overly confident that he can take on the USA. As for the interaction of the USA and China natal charts, Saturn 21*11’ Sagittarius (about to return to direct motion just 5 days after the eclipse) opposes the USA natal Mars 21*21’ Gemini in the USA seventh house, and squares (90* angle) China’s progressed Mars 22*05’ Virgo in China’s eighth house. The USA will now push China hard over North Korea’s nuclear program. With the USA progressed Saturn 3*3’ Scorpio opposing China’s natal Ascendant, natal Moon, progressed Venus and progressed Jupiter, all in early Aquarius, China feels bullied, but also realizes that she is still weaker in relation to the USA. There is potential for all-out war developing in 2018-2020, as shown by North Korea’s Saturn return chart. 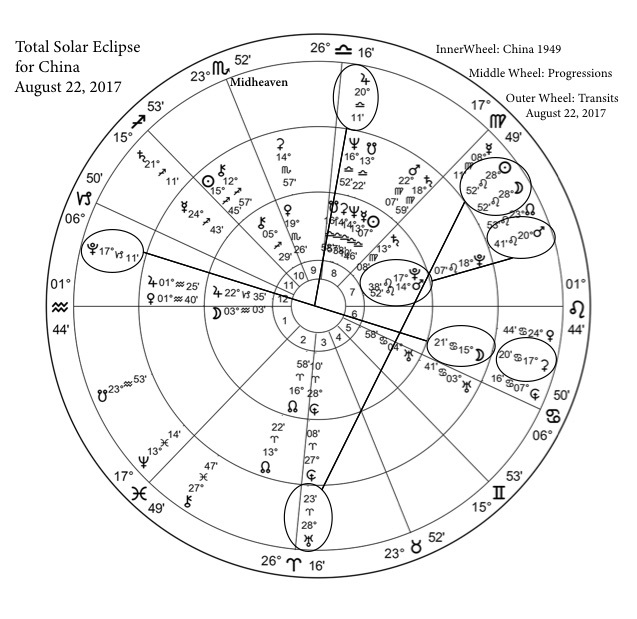 Because the Saturn return chart is based upon the return of transiting Saturn to the position of Saturn at an entity’s birth, this means that the August 2017 total solar eclipse conjoins Saturn in the return chart also. The Saturn return chart shows the development of the entity over a 30-year span, and can be used to time important events. 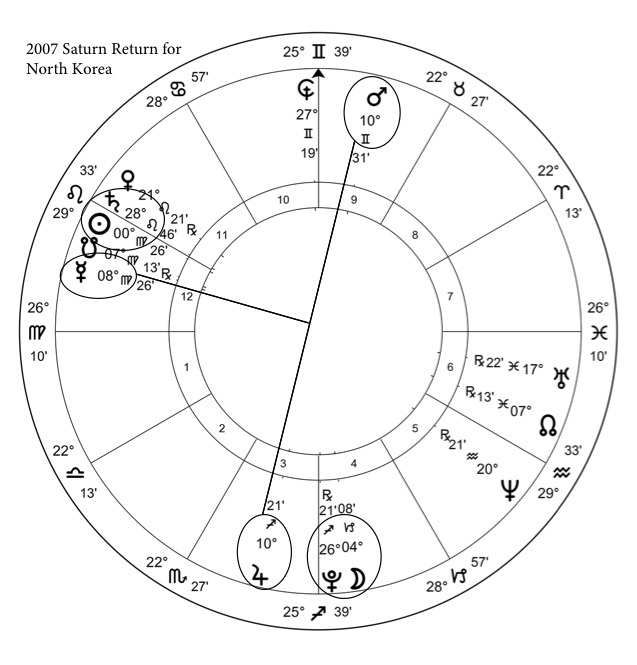 North Korea’s current Saturn return (for August 24, 2007) has Saturn conjoining the Sun 0*26’ Virgo on the cusp of the twelfth house. Mars 10*31’ Gemini opposes Jupiter 10*21’ Sagittarius, and their opposition forms a cross configuration with the Nodes at 7*13’ Pisces-Virgo. Note that Mercury, the ruler of Virgo, conjoins the South Node in Virgo, so Mercury is part of the cross also. Mercury is extremely important in this chart, for Virgo/Mercury rules the Ascendant of the Saturn return, and Mercury rules Gemini, the sign containing Mars. Virgo is the natural ruler of the sixth house of the military and weapons. Pluto rules mass destruction and death, and so indicates nuclear weapons. The Moon 4*8’ Capricorn conjoins Pluto 26*21’ Sagittarius on the cusp of the fourth house of the Saturn return. Pluto in Sagittarius is ruled by Jupiter, and in this chart, Mars opposes Jupiter, showing a complete lack of restraint over warlike behavior. Hades, another indicator of destruction, conjoins the return’s Midheaven and opposes Pluto. That the Moon, which represents the general populace of a country, conjoins Pluto and is opposed by Hades, shows the potential for mass annihilation of North Koreans. Any belligerence by North Korea will be met by even stronger force. Uranus 17*22’ Pisces in the Saturn return chart opposes both the Midheaven and the natal Sun in North Korea’s natal chart. North Korea could find itself up against a much stronger foe that will attack. Transiting Mars 20*41’ Leo on the day of the eclipse triggers Venus 21*21’ Leo in the Saturn return. Taurus/Venus rules the ninth of the return chart, and the return Mars is in the ninth – another indication of angry rhetoric from an aggressive foreign leader. Transiting Uranus 28*23’ Aries is moving through the eighth house of death for the return chart, and making a trine (120* angle) to the Moon-Pluto pair. As transiting Uranus moves into Taurus in 2018, expect the conflict to become heated, as each side stubbornly insists that they will be the winner. In November 2018, transiting Jupiter will square (90* angle) the August 2017 eclipse point, and thus also conjoin North Korea’s natal Saturn, while transiting Mars in late Aquarius will oppose the eclipse point. Venus will be retrograde in Libra, the sign where all’s fair in love and war. On October 26, 2018, transiting Venus and the Sun will conjoin at 3* Scorpio – so they conjoin North Korea’s natal Mars and progressed South Node. This time period will see North Korea making further advances in their goal of acquiring the capability to create to nuclear weapons. August 3, 2020 is a Full Moon, with the Moon 11*45’ Aquarius opposing the Sun in Leo, forming a T-square with Uranus 10*38 Taurus. This Full Moon aligns with Donald Trump’s natal Pluto 10*2’ Leo. 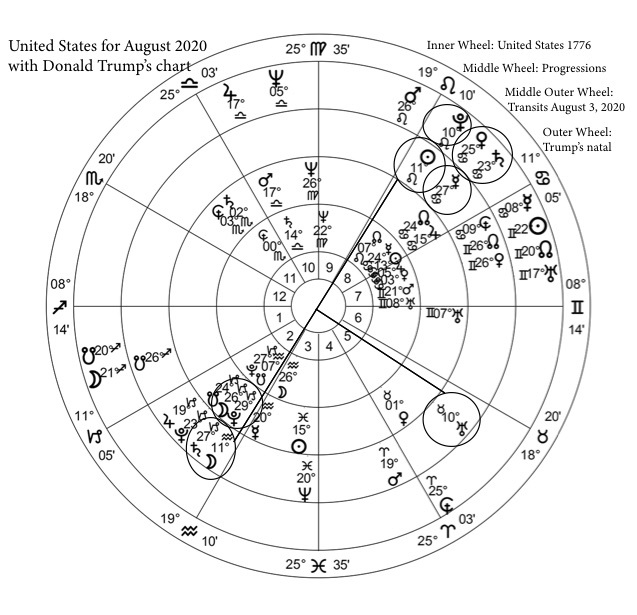 For the USA chart, there is a powerful configuration forming in August 2020, consisting of transiting Saturn 28* Capricorn conjoining the progressed Moon and natal Pluto, both at 27* Capricorn in the second house. Transiting Mercury 28* Cancer opposes them from the eighth house. Mercury at this position conjoins Trump’s natal Venus-Saturn pair in Cancer. Mercury rules Gemini, the sign of Trump’s natal Sun, and the Moon rules Cancer. Mr. Trump is feeling this Full Moon quite intensely, and he is not in the mood to take any crap from what he sees as a scrappy little foreign power. North Korea’s natal chart for August 3, 2020 has the Full Moon conjoining the progressed Ascendant 9* Aquarius. The progressed Midheaven 28*52’ Scorpio exactly squares the position of the August 2017 eclipse, and it conjoins progressed Chiron and the natal Ascendant. It’s progressed Chiron, the indicator of one’s weakness, that shows that North Korea is one that will suffer the most in this conflict. Another indication that a stronger power inflicts destruction on North Korea is found in the Saturn return: progressed Saturn 0*26’ Virgo in August 2020 exactly conjoins the Sun of the return, in the return’s twelfth house. That a destructive event will occur near the August 3, 2020 date is shown by North Korea’s progressed Moon in that time period. Transiting Hades 9*57’ Cancer will conjoin the progressed Moon 8*0’ Cancer in the eighth house of death and destruction, with both squaring (90* angle) natal Mercury 8*12’ Libra. As the point in the horoscope that signifies the people – the Moon - and the point that signifies foreign powers or enemies - the ruler of the Descendant – are at odds, and the Moon is in the house of death, this date does not bode well for North Koreans. *This chart for North Korea was rectified by astrologer Jamie Partridge.